ALTON — For more than four years, Cornerstone has given area families a place to go in times of trouble. There is now a place to live for some. Cornerstone is hoping to have its first family placed in a new transitional housing unit located (Alton) next week. The house, anonymously donated to Cornerstone a year ago, should be fully functional in time for an open house from 3 to 4:30 p.m. Sunday. Lane said that Cornerstone has worked with area landlords for a long time in helping it clients find housing. Cornerstone will now be able to directly supply temporary housing to a family already enrolled in the ministry’s various programs. Cornerstone offers counseling for those in or headed for divorce. Lane said the first family hopes to move into the transitional housing unit as soon as an occupancy permit is attained. Lane said each family would stay in the house anywhere from three to twelve months, with six months probably being the average stay. Cornerstone had originally planned to begin work on the house last year, but was delayed until the spring. 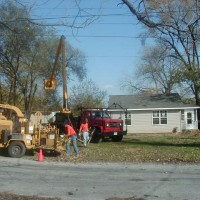 Several churches and organizations have donated time and materials to the project. They include River Bend Contractors Inc. (backhoe, labor, concrete mixer), Calvary Baptist Church (siding, windows, electrical, labor), Hart Contracting (material, tools, machinery), Sears (new washer and dryer), Bethel Baptist Church of Troy (Adopt-A-Room), Wayne Jackson Tree Service (removal of approximately 20 trees on the lot), United Carpet (carpet), Terry Maltzman Inc. (tile flooring), Brown Street Baptist Church (roof installation), Valley Contractors Inc. (demolition dumpsters), Fischer Lumber (roofing) and Cabinet Solutions (kitchen cabinet custom labor). Lane said those four wouldn’t want their names used. The house has a new foundation on one side, a new roof, siding and windows, plus extensive renovation inside. “We could still use a new refrigerator and stove, plus more bedding,” Lane said. “But we can be functional at this point. We still need to get a gravel driveway and more landscaping next summer, plus I would like to put together a youth project to build a garage. For more information about Cornerstone, call 465-4357 or visit www.buildingthefamily.org.